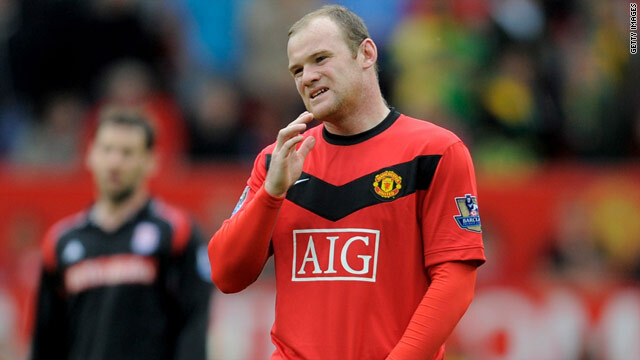 Wayne Rooney grimaces in pain after pulling up with a groin injury in Manchester United's 4-0 win over Stoke on Sunday. (CNN) -- England striker Wayne Rooney is expected to be fit for the World Cup in South Africa despite suffering another injury setback on club duty with Manchester United on Sunday. The 24-year-old, who last month was sidelined with ankle damage, went off with a recurrence of his recent groin problem 13 minutes from the end of United's 4-0 victory over Stoke. He was unable to score, finishing his European season with 34 goals and missing out on the Premier League's golden boot award to Chelsea's Didier Drogba, who netted a hat-trick in the 8-0 victory over Wigan that ended United's three-year grip on the title. England coach Fabio Capello will name his provisional 30-man squad for South Africa on Tuesday, and United were quick to dispel any fears that Rooney might be not fit for his second World Cup finals appearance. "He should be okay," assistant manager Mike Phelan told the UK Press Association. "All the phone calls and all the worries we can dispel straight away. Marcello Lippi, coach of world champions Italy, will also name his preliminary squad on Tuesday. Veteran striker Francesco Totti's chances of being called out of international retirement were seriously damaged by his red card in the Italian Cup final defeat by Inter Milan last Wednesday. The 33-year-old redeemed himself with two goals on Sunday as second-placed Roma kept the Serie A title race going into the final round of the season, but on Monday he was handed a four-match Italian Cup ban for his controversial challenge on Inter striker Mario Balotelli. Balotelli, who said Totti had abused him, was also given a one-match suspension along with Inter teammate Cristian Chivu for separate incidents. Totti won the last of his 58 international caps in the 2006 World Cup final win over France, which ended Lippi's first stint in charge, and made himself unavailable a year after that. Totti's Roma strike partner Luca Toni also faces an anxious wait to see if he will be included in Lippi's squad. German media reported on Monday that his parent club Bayern Munich do not want him back despite having a contract until the end of next season, while Italian paper Gazzetta dello Sport said Roma president Rosella Sensi was unwilling to extend his stay.